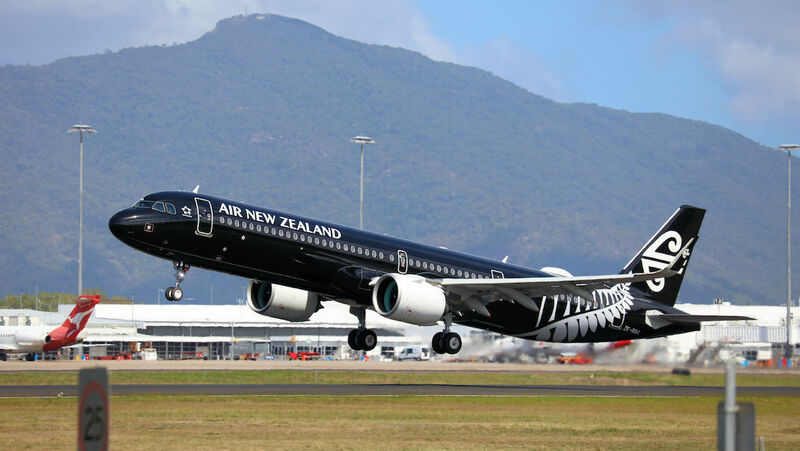 Air New Zealand says it will upgauge its Auckland-Gold Coast flights to the larger Airbus A321neo and boost its schedule on the route to five flights a week from February. The aircraft change and addition of an extra flight a week represents a capacity increase of about 60 per cent, Air New Zealand said on November 13. The airline recently took delivery of its first A321neo, which is expected to enter commercial service on November 23, with the NZ739 from Auckland to Brisbane the inaugural flight. A second A321neo is also due to arrive “in the coming weeks”, Air New Zealand said, with the entire order of seven A321neos and six A320neos expected to be delivered by the end of calendar 2019. The neos will replace its A320ceos currently being used on its trans-Tasman and Pacific Islands network. Air New Zealand has configured its A321neos with 214 seats in a single-class layout, while its A320neos will have 165 seats. By comparison, the existing A320ceos have 168 seats. The airline, which is the first in Oceania to have the A320neo family of aircraft, has chosen Pratt & Whitney PW1000G engines to power its A320neo and A321neo fleet. “The Gold Coast is a popular destination for Kiwi tourists and Australia is New Zealand’s largest source of inbound visitors, so it’s fantastic to be able to increase capacity to meet this demand,” Air New Zealand chief revenue officer Cam Wallace said. Air New Zealand’s move to add a fifth weekly flight and use a larger aircraft comes as low-cost carrier AirAsia X plans to end fifth-freedom flights between the Gold Coast and Auckland from February 2019. The budget carrier will maintain its daily Kuala Lumpur-Gold Coast service, although flight times have been revised given the aircraft no longer continued onto Auckland. AirAsia X has served Auckland via the Gold Coast from its Kuala Lumpur hub since 2016 with Airbus A330-300s featuring 12 lie-flat premium seats in a 2-2-2 layout and 365 economy seats at nine abreast. It is the second time the airline has withdrawn from the New Zealand market. In 2012 it dropped nonstop flights between Kuala Lumpur and Christchurch after being on the route for about 15 months, citing high fuel prices. VIDEO: The arrival of AirAsia X’s inaugural Kuala Lumpur-Gold Coast-Auckland flight at Auckland Airport in March 2016 from AirFlowNZ’s YouTube channel. wouldn’t it make a lot of sense for air nz to continue their A321 neo Auckland/Gold Coast flight onto somewhere like Perth ? They seem to have demand for Auckland/Perth nonstop & now no longer “in bed” with virgin australia, they should start flying some Australian domestic routes. Does anyone know if they are allowed to fly domestic Australian routes? Yes apparently, any NZ airline can fly Australian domestic routes under SAM (single aviation market). I was told that they operate under much simpler NZCAA rules (than CASA rules) & that they have very little to do with CASA at all. Seems Australian airlines are at a distinct disadvantage. This wasn’t the case when Air NZ bought into Ansett. Can anyone confirm above is correct, as told 3rd hand. No disadvantage to Australian carriers who operate in NZ on their AU AOC which Jetstar initially did when it based its first 2 aircraft (for international ops) out of Christchurch. Qantas also entered the NZ market on its AU AOC in 2001 following the collapse of the ‘Qantas NZ’ franchise. From what I’ve gathered CAA and CASA work fairly closely and even align policy at times to create more commonality within the single market.